Welcome to a world that is getting stranger by the minute. Who says you can't get ice from sand? Snowfall in the desert is a term that may have sounded like a big joke to some people a short while ago, but it seems fantasy has finally caught up with reality. 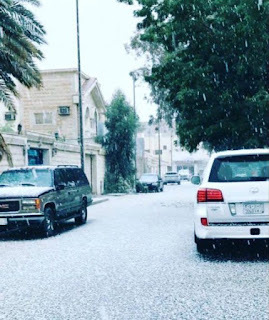 It is a land known for its dry heat and drier deserts but Saudi residents woke up this morning to a rather cold surprise—snowfall in Saudi Arabia! Winter replaces scorching heat. Plunging temperatures in parts of the country saw the powdery desert turn into a winter wonderland, as freezing conditions took hold. Tabarjal in the northern Al-Jawf region saw temperatures plunge to -3C, while the northern province of Al-Quryat hit -1C. Have fun while the white flakes last.Some Saudis took full advantage of this rare opportunity – and tried their hand at road ‘skiing’. It feels like Europe in winter time. One contributor claimed the weather was ‘so European’ he quipped about feeling like a scholarship student – a conversation typically had by Saudi students while in their (much colder) host countries. Even the motorists gave full respect to the strange occurence. Perhaps unsurprisingly, Saudi drivers didn’t seem too confident on the icy road streets, preferring to park up instead. Bring out the snowman! Saudis have reacted with a healthy dose of good humour and taken to social media to share their excitement – and snowmen photos. Powerful effect on mood. Clearly, the white stuff brings out the inner child in the best of us—while it lasts.